When the Disneyland Half Marathon Weekend race registrations opened I went all crazy and decided I was going to run every single race. I didn't want to miss out on any special Disneyland 60th Anniversary bling. Smart choice. 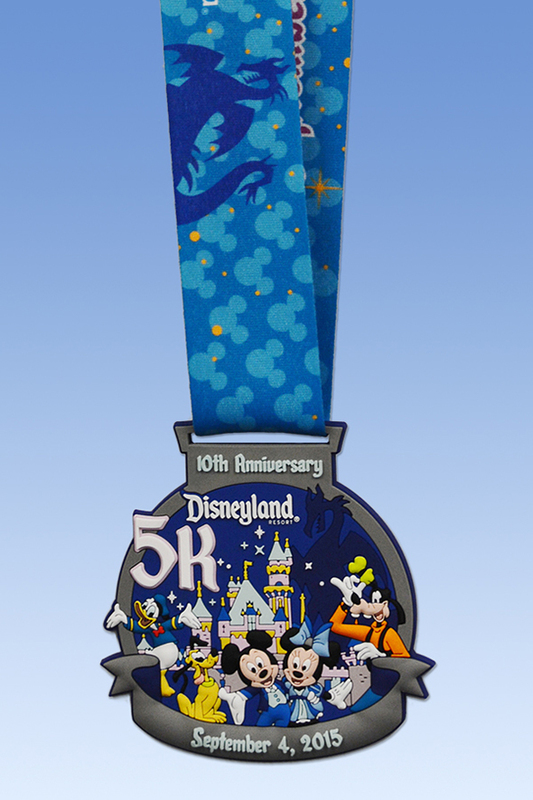 This medal is beyond cute and I love that Maleficent's dragon's shadow was included in the artwork. On the morning of the 5K my body made the costume choice for me. 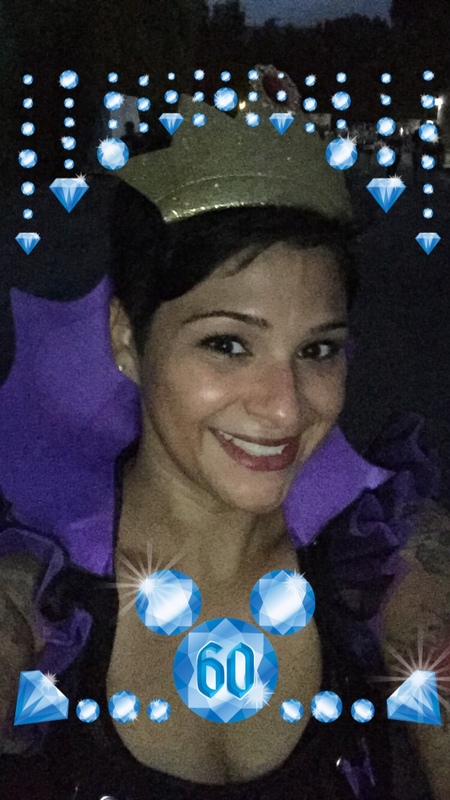 After only a couple of hours of sleep - and a little too much of the Sneaky Pete - I didn't want to fuss with anything so I threw on the Evil Queen costume and headed out the door to meet my friend Emelia who was dressed as 60th Anniversary Minne. So cute! At 5:30 AM sharp it was go time! 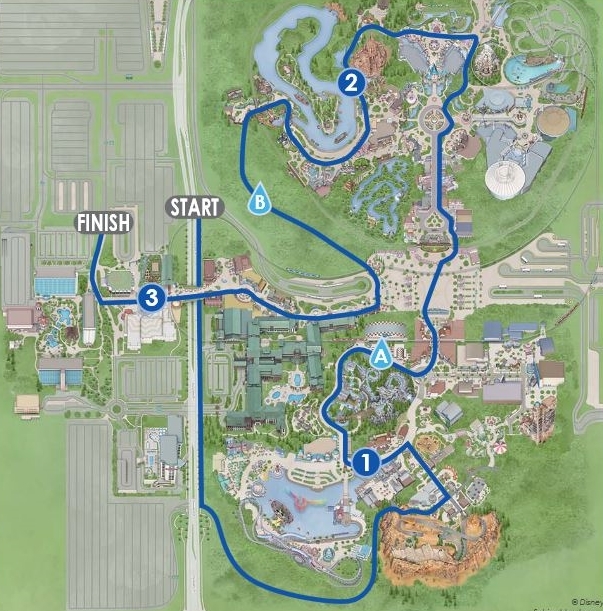 The 5K courses at Disneyland are always fun because you pretty much run right into the parks from the start line via a backstage area. We ran into Disney California Adventure and through Cars Land. It is always an awesome neon paradise. We ran through Disney California Adventure and passed Grizzly River Run where I believe Chip 'n' Dale were stationed for photos. I kept running and continued towards the Esplanade and into Disneyland where Pinocchio & Gepetto were waiting for me. The Disneyland Third Shift Custodial team was out in full force chEARing us on. So rad! By the end of the weekend I felt like we are all best friends. In Fantasyland I ran into snow White and Prince Charming. She's acting like she's afraid of me, but I promise I was really nice. Pardon our demon eyes. It's totally normal to take a selfie in Frontierland while drenched in sweat and dressed like this. Right? I knew it! I knew Maleficent would be on this course, but I had no idea she'd be so far away. All of the photos taken with my iPhone were horrible in this low light, but sadly this one was especially awful. We did have a cool moment when she realized I was the Evil Queen. 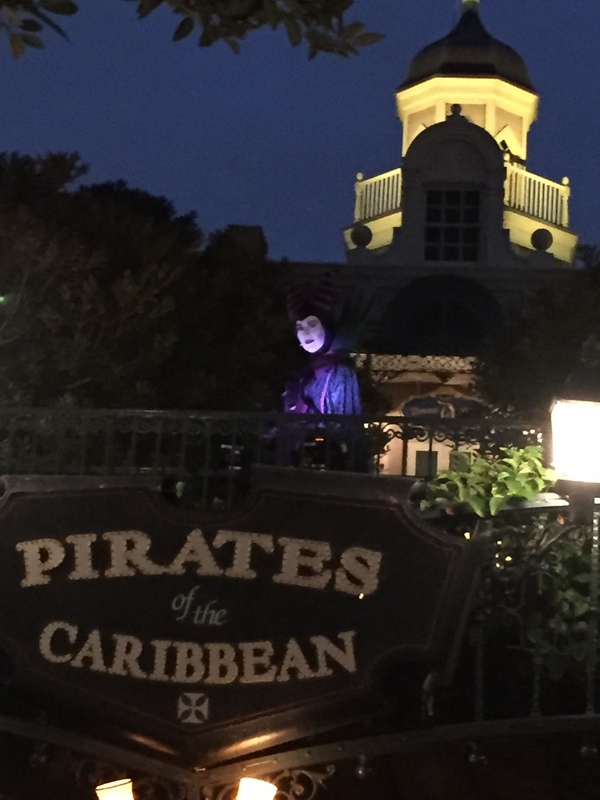 I continued running from New Orleans Square to Critter Country through Downtown Disney and straight to the finish. See that photo of me above? It was taken by the fabulous girl pictured below. She and I were complete strangers. We began talking to each other at the finisher's photo area and based on her Australian accent and her hair color it occurred to me that this might be the awesome gal my friend Debbie had been wanting to introduce me to. I interrupted her mid-sentence and squealed, "OMGareyouDebbie'sfriendErinfromAustralia?!" to which she replied, "YesyoumustbeJindy!" I was really happy I was right or else she might have thought I was insane. 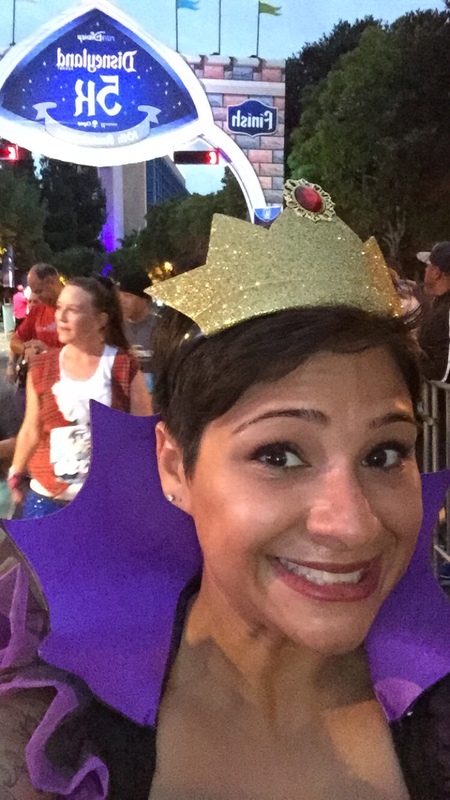 What are the chances that a gal from Nor Cal and a gal from Australia would randomly run into each other at the Disneyland 5K finish and start up a conversation about race photography rules without realizing their friend in Portland was totally hoping they would meet this weekend and send her this picture? That is magic, people. 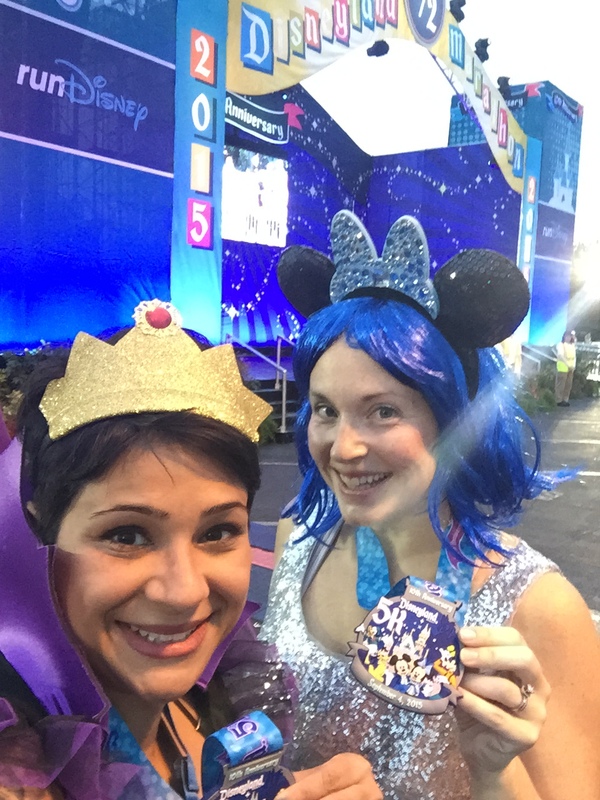 Right before making our way through Downtown Disney and back to our hotels, Emelia and I stopped for what is becoming our traditional post-race selfie. I really love running with her! I'm so happy I registered for this race! When it was all over I was super sleepy and delirious but looking forward to the next stop of this adventurous weekend: the Cigna Blogger Meet Up and Cooking Demo at Napa Rose.